A couple weeks ago I met one of the coolest cats I'll ever meet. He was dumped at the shelter with his three sisters after his parents got a divorce. Four beautiful kitties, all just left there to hope that someone else would take them home. We took one look at his sweet face, and immediately knew we had to save him and his sisters. I asked our good friends at Forever Home Feline Ranch in Springfield, IL if they could take him in, and they said yes! Hurray! We gave the shelter the good news, and picked Lestat and his sisters, Callie and Smokey up soon after. His other sister, Bella, was adopted. The first picture we saw of Lestat. This was his intake photo. What a doll! We have a friend who has a condo that she is not using, and she offered it up to us as a "kitty condo" where lucky cats can camp out for a short time while we arrange their transport. It's like the kitty bachelor pad! We visit them lots and they are safe there. Lestat and his sisters went there from the shelter. A couple hours after they were dropped off there, I rushed over to meet our new rescue kitties. I just knew they were going to be great cats! Oh hai! You found me. The next time I went by, he was in a different cabinet. I knew which one he was in right away because the cabinet was meowing. Silly boy! He wanted me to know where he was. That was him in that cabinet. He wanted to come out, I could just tell -- he was just really scared and not sure where he was or what was going on. A day or two later, he was out and about and I was holding him and loving on him like he deserved. Me and Lestat having some snuggle time at the condo. Lestat was a shy, timid boy. A huge boy in frame, but just so sweet and fragile seeming in character. He was a huge sweetheart. I could tell he was sad, but I was happy to see his spirits lifting as the days went on in the condo. I went to visit as much as I could, and while I love all the kitties we help, Lestat immediately found a special place in my heart. And it wasn't just me! My dad thought about adopting him himself and everyone in our transport group fell madly in love with our big boy, too. Lestat relaxing in his bed at the condo. This past weekend, the kitties' big day finally arrived. It was transport day! Lestat and his sister, Callie, had a little bit of a cold, but nothing major. They were all packed up and hit the road for the best day of the rest of their lives -- they were going home! Along the way, the drivers kept careful tabs on everyone and we noticed Lestat was a little bit stressed out. He was always a drooler when he got excited (he was drooling when he first got to the condo, but then stopped once he knew he was safe and comfortable), and a few drivers said he was drooling a lot on the road. We had Spirit Essences, which is great for stress, so we made sure to put some in his cage to calm him. Kitties a little stressed on the road is a pretty normal thing. He threw up along the way, too, and we made sure his carrier was covered to keep him as calm as can be. Covering carriers is a good way to calm a kitty. Our poor boy was just not a being a good traveler, and we couldn't wait to get him to his safe place to rest and relax. We also had the idea to put him and his sister Callie in the same carrier, since they had cuddled together so much in the condo. He might feel better with her around! Once we did that, he did seem to relax, and we felt better about that. Lestat zenned out with his other sister, Smokey, earlier in the condo. Late that night, the caravan of kitties arrived at their sleepover spot in Chattanooga and we all were happy to give Lestat a break especially. He seemed fine overnight, wasn't too interested in eating, and stayed close to Callie. They packed up after a night's rest and hit the road again for day two of their journey. They would be at the Ranch soon! Our first drivers of the day said he seemed much better, was not as fussy and more relaxed. He was snoozing with another driver (and snoring loud, she said!). We thought he was calmed down from the day before and in for a better day today. Did I mention what a BIG boy he was? This is me holding him at the condo! Then I got a phone call I never imagined I'd get. The wonderful women driving the leg to St. Louis were doing a check on the kitties to change out someone's stinky puppy pad (they didn't know who needed changing), when they discovered Lestat was not responding. He was in the carrier with Callie, so they took him out and tried to see if he was responsive at all and if his eyes were open. How or why it happened, we'll never know. But I am so completely heartbroken and sad and crushed and overwhelmed by this. We talked to our vet. Lestat got a full and thorough checkup before he left. His heart seemed fine and he was only a little sick -- nothing stopping him from traveling. He was just so easily stressed out, and I think that something happened to do with that. Even though he seemed better. Comfy Lestat. The cute face I'll always remember. I'm crying as I write this post, and have been for hours. Every cat is special, but Lestat was extra special. I truly fell in love with him, as did everyone in our transport group. We all joked about him not making it to Springfield because one of us might steal him and not pass him along to the next driver. But we never thought that he actually wouldn't make it. He was in his carrier with his sister, Callie, when he passed and I am grateful for that. I'm glad he wasn't alone. I wish he was still here with me or at the condo. I miss his face and his little meow. Getting a little drink at the faucet in the condo last week. We don't know what happened or why he passed. All we can think is that maybe the stress was too much for him or he had something else going on that we didn't know, like something genetic or a heart issue. Prowling around the condo. Wasn't he a majestic boy? I live to rescue and transport these kitties. Nothing makes me happier than saving them and making sure they are ready to travel and then sending them off to their new, happy forever lives. So far this year we have helped transport 53 cats. Fifty-three cats this year, and it's only March! So many lives saved. I supposed the odds are, as with any rescue effort, that something will happen to some of them along the way. You do your best and know that every one saved is a miracle. I am holding on to that. The other 13 cats on this transport are going to live the dream we had for Lestat, and for all of them. They will find wonderful homes and live happy lives and be safe and loved. And all of us will always love Lestat. He'll live happily in all our hearts forever. Thank you to Cutehead Dana K. for this beautiful graphic. She was also one of his drivers. 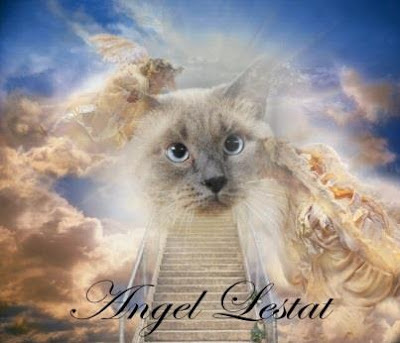 Lestat is now buried in a special place at Forever Home Feline Ranch where he was headed. That was going to be his home, so it should be. He was only one driver away from making it. His sister Callie will hopefully get the best home, and this way she can be near him until she does. I am so grateful to them for being so wonderful and caring. I know he will be one of the kitties waiting for me at the Bridge when it's my time to go. Let's carry beautiful Lestat in our hearts and keep on helping as many kitties as we can. Thanks, everyone, for all your help always. And an extra special thanks to all of the Caboodle Caravan's drivers this weekend for getting them all to Illinois and keeping an extra eye on our man. It was a privilege to meet Lestat, however briefly, as one of his transport drivers, and to know him and love him from his pictures and video and story. Run free at the Bridge, Lestat. You will be forever loved. Dorian, your tribute to Lestat is remarkable. Thank you for saving him from a horrible afte if he had been left at the kill shelter. He had love and kindness all the days after you found him. He will live on in your work. I am proud to know you. Oh Miss Dorian... this just breaks my heart as I know it does yours. He really stood out, I remember seeing him and just thinking he had such a spark!! How horrible people could abandon him in the first place is unconscionable. What a blessing you and the wonderful people transporting him would have been hin his last hours. I am so sorry for your loss, and for the loss of this special boy. Fly high, sweet boy. I'm so sad to hear this. I'm lighting a candle for Lestat and his friends. Special hugs to the driver -- how hearbreaking for them, too. Fly high, Lestat. Oh my gosh! I'm in tears here too. Oh that poor sweet boy. My heart goes out to you, I'm sorry you lost him as he was so special to you. I think maybe that's why he was so special, he wasn't faceless, nameless, and gone with no one to care. We all know him now, and he was well loved. Hugs and purrs from all of us. Oh Dorian, Oh no. He was beutiful.... Words fail me. I am so sad to hear this. I wish Lestat had had the chance to have the life he truly deserved, but at least he had the love and devotion of so many wonderful humans who I know will honor his memory by working hard to make sure other cats in need find good homes. I know his memory will live on with all of you. I am so very sad to hear this beautiful boy didn't make it to his forever home. Tragic. But I am grateful that he was loved and helped in every way possible by you all, once handed in. Thank you ALL for all you did. If only pet owners wouldn't be so irresponsible ~ a cat is for life not just until it no longer suits. I despair at some people who profess to love animals. That was something I knew I shouldn't read, as it made me quite sad. Such stories do serve to make me appreciate cats all the more, though. I do not share space with cats, but would love to and think I one day will. I'm not even in the same country as you, but love to read of the cat transports. News of the transports are like chicken soup for the soul. Lestat was loved, as he always should have been. One can't help feel loss, but we must all be glad for that. I've got some tears on my keyboard and ought to wipe them off. Dorian, My heart goes out to yours, I knew, the 1st time we "spoke", how much Lestat meant to you & it was because of this that I knew this big goofy looking lover boy was the right fella to fill my lap and life with love after losing my beloved kitty Izzy to cancer 2 months ago. He just stole my heart as he did so many others and i was so excited that they put a "hold" on him and he would hopefully be with us in his forever home next weekend when his cold cleared up and he de-stressed. Though I only met him through Dorian, he was already much loved in our home and his big brother and sister had already heard all about him. It breaks my heart that we won't be able to give him the forever home that he deserved so much. Healing hugs to your heart and to all the wonderful transporters who tried so hard to bring these kitties home. R.I.P. Lestat, many many people loved you. Oh Dorian, I am so sorry. I can only imagine how you feel because I am very sad that this beautiful boy is gone. But you and everyone involved with him did their best and he knew he was loved. Just love your tribute to him. We will carry him in our hearts forever. Take care. And...it was wonderful that his sister Callie was with him!! My son goes to college down in Springfield--in fact, I was just there yesterday. I will have to look up this rescue place when I go to visit him. Thanks for caring for all these kitties, pally. I can't imagine the sheer amount of stories just like this one there are each day. Oh Dorian, I am so sorry! That is incredibly sad and my heart aches. I wish Lestat had made it to his furever home too :o( I can't imagine getting that kind of news and just know that all your readers care and are thinking about you guys. Purr, purr, purr. So sad to hear this. What a beautiful boy. I am at a loss for words. Hugs. Dorian, I am so very sorry. I know your heart is broken for Lestat, but I believe he knew he was loved and that you were trying to help him. At least thanks to you he had a shot at a forever home, instead of spending his last days in a shelter. Dear Dorian, I'm so sad to hear that. As others have said, at least he had love and attention during his final days. Such an adorable mancat! His eyes looked alittle sunk like he was dehydrated.I have a funny idea he was diabetic.I have a diabetic cat and the faucet is his favorite place to drink water.They drink allot! !If the vet just looked at him with no blood test you would not have known.I feel bad ,too.I'm glad he died with people who cared for him because the previous owners did not. Oh, Dorian, I'm so sorry! *hugs* to you and everyone who was so kind to him on his final trip. Lestat, was an amazing kitty. I fell in love with him from his pictures. So, getting to know him & hold him was such a treat for those of you that were helping him. I have no nice words to say about how he & his siblings ended up in these circumstances so I won't say anything. But, thank God you came along to get them to a better environment. My heart breaks for you & the transport drivers. RIP Lestat, run free at the Bridge, sweet baby! This work of saving these kitties is so wonderful. I love all who are involved & congratulate each of you for the awesome numbers so far this year & pray for continued success. I lost a kitty several years ago to very similar circumstances. No answer as to what happened but just had to gain comfort knowing she was loved beyond measure & went to the Bridge peacefully. We have leaky eyes. Maybe he died of a broken heart. Broken by the monster who dumped him and who I feel should know about this. Then he fell in love with you and you parted. We don't blame you; we blame the monster. You only do good by the kitties. My heart is breaking and I'm crying Dorian. He was a lucky boy to have known the love he did before he passed. Sweet boy. xo bless him. I am totally devastated to hear about this wonderful kitty's sudden passing, but I know that he was given LOTS of love while you and your fellow cuteheads were taking care of him. I love you for what you are doing for all these lovely kitties, and hope you will continue transporting these very special creatures to their forever homes. I just wish we had something like this here in Alberta! God bless you and your fellow Cuteheads!!! Poor baby :(. Again, so very sorry to hear this news. The story made me cry too. He was a very handsome kitty and had such a sweet face. I am so very happy that he knew he was loved and cared for in the end and didn't meet this fate at a shelter. I hope his sister isn't too sad at losing him. Thank you doesn't even seem enough to say to you about all that you have done for these babies. Thank you to the other cuteheads that have done so much as well. HUGS I'll be thinking of you today. I'm so so very sorry. I'm so glad you and everyone else involved gave him the love he deserved. Please take comfort in that and thank you for your amazing transports. man. I am so sorry about his loss. Made me tear up. Thinking of him and everyone. This was a beautiful story about this cat. He was one of the sweetest that i read about and I am glad that he will have his place where he went. I think the poor baby was sick as to why he didn't make it. Dorian, I'm so sorry to hear about Lestat. What a beautiful cat. Thanks for everything you do. 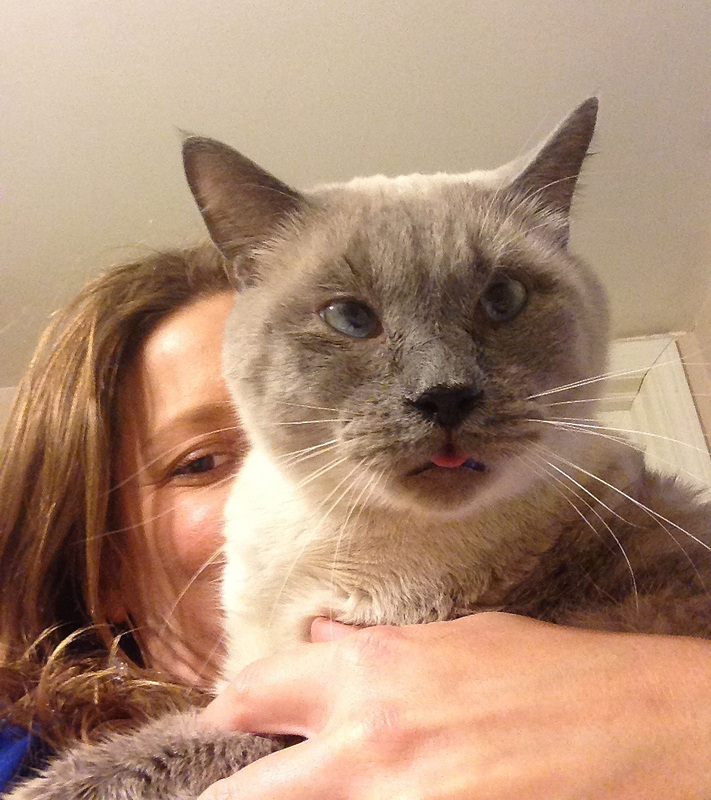 You have made such a difference in the lives of so many cats and their forever owners. I'm so sorry to hear this sad news, he was such a beautiful boy with such a sweet meow. I know everyone did all they could for him, who knows what hell he and his sisters went thru with that couple...divorce is always traumatic but for both parents to give up on them is horrendous and unforgivable. He's at peace now,everyone will make sure his sisters get to loving forever homes soon and I hope the ranch will relay Lestat's story so they will get extra 'Lestat' hugs every day. Thanks Dorian and the Caboodle drivers, you gave Lestat hope, he did his best to make it but he just couldn't. Rest in peace big guy, you are very loved. Oh, this is so sad :( I'm so sorry for you and Lestat. But I'm glad he had so much love at the end. He'll be smiling down on you and purring. I cried as I read Lestats story... I am so sorry that he was't able to make it to his new home... My heart goes out to you all who worked so hard to give him a stable, loving home that he so desperately needed.. God bless you all and rest assured that there are little meows and purrs waiting for us all in Heaven!!! I'm so sorry to hear about Lestat. He sounded like a very special boy. He's beyond the Rainbow Bridge now. Shirley, I do so wish that Lestat had found his forever home with you. Each of us fell instantly in love with him, and we all knew that he deserved so much more than what life had handed him thus far. Dorian and her group in Florida have such a keen eye for the special kitties, and they will have many more that will need good homes like yours very soon. I am so sorry for the loss of your Izzy! If you are still looking when the next Caboodle heads your way, maybe there will be one for you! I will NEVER forget Lestat, and I am smiling at the thought of him being in your loving family- with a brother and sister who were waiting for him. That is exactly what he would have needed. A big guy who needed big love! Like many people Lestat had a life deprived of all the love and peace we all should have - until the end. Thanks to you and all he knew nothing but love and contentment - not to mention an abundance of cabinets. If God were not loving why would he have given us cats, dog, birds, and critters of all shapes and sizes to bring happiness and companionship to us all. And that same God will repay them by making their eternity one filled with more love and happiness than they could ever experience on earth. No more pain or sorrow for them, and for us an assurance that we too will be with them again as they make our transition to our new homes an easy one: we can always count on them. Didn't even know U,but I miss U! I was trying to read this post earlier today at work. Needless to say, I had big crocodile tears falling & couldn't finish reading. After getting home this evening I finished the post. So sad. My heart is breaking for you Dorian. I could tell how much you really loved him. He was shown love his last few days, by you & members of the Cute Transport. Peace Lestat. You are loved by us Cuteheads ! I am so sorry about Lestat. May you be comforted knowing he is healthy and happy over the Rainbow Bridge in Heaven. I am sure he will meet Angel Clark Kent Super Kitty, who has been welcoming all the new arrivals. And some day we will all meet him there. I'm very sorry about Lestat. I'm just so glad he was surrounded by such loving and caring people who were trying to make such a wonderful difference in his life. Rest in peace sweet Letat. Oh Dorian....I'm sitting here reading your lovely tribute with tears flowing like Niagara, and also the other comments. I am devastated - he reminded me so much of my beautiful Tawny (1st Siamese) and the cupboards, and Tawny was also about 12 lbs. Lestat's eyes did look a little weepy like mine but we don't know what it really was. Maybe anxiety, heart, we do not know except he was loved by you and others, and his sisters and my heart breaks that he did not make it to his forever home. Sorry darling, I share your tears just like when Tawny left us - maybe they'll meet - it's been a long time. I have to leave now. R.I.P. Sweet Lestat. What a crying shame. :( At least he was with people who loved him, and he knew kindness, right until the end. Sometimes cats have a hidden congenital heart ailment, and we never know it until they suddenly and unexpectedly pass away. It happens so fast, they're gone in a moment so there's no time to suffer. Still, it's always sad to lose a beloved kitty. My condolences to all who love Lestat. shame on the people who abandon their pets SHAME on them I hope they were notified selfish selfish people I am so sorry Lestat, thank you for all you do rescuers! Oh my ! Tears are falling. I know your pain. We love them all and clearly Lestat was super special! Thank you for all you do to help these kitties and making their world brighter. Lestat is running freely, happily over the Rainbow Bridge. Better to die on the road to freedom and happiness with your sibling beside you than alone in a cold jail cell or at the hands of a shelter tech. Even better to have some good final days in a home with true affection and appreciation. That said, I'm really sorry this happened, Dorian. My gut feeling is that when that infection got into him, it exacerbated some condition he already had. There was nothing anyone could have done. My heart goes out to you. Stay focused on all those deliveries you have made into loving arms. We send you hugs and purrs from Los Angeles! Such sad news about Lestat, thank you for trying to help him. His time with you was full of love and happiness. Your dedication to helping cats like him is very appreciated. Oh dear friend, I'm sitting here crying for Lestest and for you., How very sad. for you, for him, and for the transport team. Yes, please keep in mind the great numbers you have all helped - it's remarkable! Yes, with the numbers you have transported, an accident of some sort is bound to happen. My heart goes out to all of you and especially to the team member who's watch it happened on., Do not blame yourself and please don't stop volunteering - you are so needed. Hugs to all involved. Bless you for taking care of and loving Lestat. I am sorry that he was so scared when you first got him, but happy that he did calm down and have some good times too. IT just breaks my heart, I hate to hear on anyone giving up pets as if they are just disposable objects, but not really my business. I am really glad that Lestat was feeling loved and that he got to go while next to his sister. You all did your best, you do wonderful things, and I am sure that in the time Lestat was with you he learned what it felt like to be the best big boy in the world. Thanks for all you guys do. Thank you for your comments everyone. Writing about Lestat helped me tremendously and I love having a post about him that will love on forever. I've already been back more times than I can count to watch his video. Every one of your comments helps a little more. I am so grateful to be surrounded by such a caring, understanding, wonderful group of people who understand how important each and every animal is. Thank you for letting me share this with you, and for being her for me and all of the transport drivers who loved him. He was a very special boy indeed. OMC dat iz so sad. U made H2 hab leaky eyes readin bout dis wunnerful kitteh. So so sorry for the loss of Lestat...he reminds me so much of my Nylablue...stocky, solid & sensitive & oh so fragile!!! You made his last days good; he knew he was loved....I KNOW he will be waiting for you @ the Bridge for sure. May his memory comfort you always..
Too sad, He had such a sweet face. Perhaps he an underlying condition that had not been diagnosed was responsible. I had a ragdoll cat years ago who had an enlarged heart unknown to me. His big wounderful heart gave out a little before his second birthday. I don't think the stress of the drive was really a factor. I think it was something that was going to happen no matter where he was. So many people were involved in trying to rescue him, he had to feel safe esp. with his sister nearby. I hope that the family who wanted him will try again to save another kitty in his honor. I am catching up on mu CUTES as i have been in the hospital and I just had to let you know how sorry I am about Lestat!